Land Area is 1236.43 sq km. Population is 23,450, From Where we have in our files 8893 Gravestone Inscriptions from 51 cemeteries [all Glengarry cemeteries has been copied by us.]. 1 Baptist Baptist North Lancaster Lancaster Con. 6 lot 24, 1986 9 part of Gravestones of Glengarry Vol 3, 1988, 1598265 - item #3 on reel 6539 MR ?? Note: Abandoned Cemetery, west of the Protestant Cemetery about 1/2 mile Protestant Maxville Kenyon Con. 17, lot 7, Indian Lands, no no known markers 7 pp (introduction & map) AWF Library 1598267- item #1 on reel 851 MR ?? or Old Presbyterian Presbyterian Dalhousie Mills Lancaster Con. 8 lot 9 (between con. 8 & 9) 1986 12? 18 pp see Gravestones of Glengarry Vol 8 1598267 - item #3 on reel 848 MR ?? Protestant Williamstown, Charlottenburgh Con. 3, NRR lot W10, 1973; updated 1998 22; 21 . part off Gravestones of Glengarry Vol. 1. 1976 1598265 832 MR ?? Note: Across road from St. Columba Church on the north side of the road, abandoned. Protestant Kirk Hill Lochiel Con. 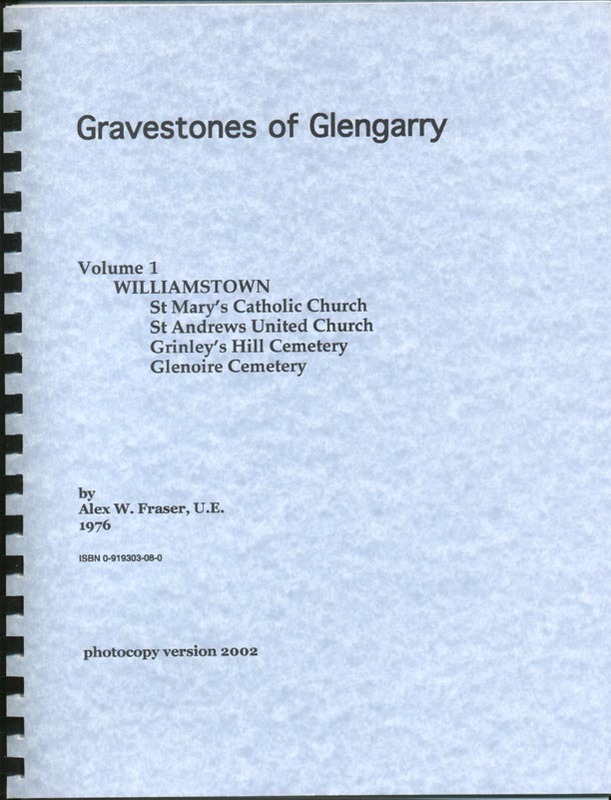 7, lot 26, 1980 1 7 pp see Gravestones of Glengarry Vol 5 1598267 - item #27 on reel 860 MR ?? burial ground Glen Nevis Lancaster Lot 16, con 6, 1988 1 7 pp AW Fraser Library 1598267 - item #27 on reel ?? MR ?? The Island, Con. 8, lot 5, S. end, circa 1980, copy donated to us 4 12 pp AW Fraser Library 1598267 - item #4 on film 6482 MR ?? Note: Subdivided by Kirktown plan 15 to lots 4 & 5, also known as Lower Old Glebe Property. 1978, updated 1998 108; 116 . Gravestones of Glengarry Vol. 2 1978 1598265 - item #2 on reel 849/5366 MR ?? Con. BF lot 7 Highway #2, 1979 269 60 pp AW Fraser Library 1598267 - item #9 on reel 827 MR ?? McCormick Road about con. 2 lot 36, 1992 8 part off Gravestones of Glengarry Vol 4 Alexandria, 2008 1598267 - item #5 on reel 867 MR ?? On property of Edmund Ross, ?? ?? 7 pp ?? not done 831 MR ?? Con. 6, pt. lot 28, 1974 189 29 pp see Gravestones of Glengarry Vol 7 1598266 - item #14 on reel 869 MR ?? Lot 23 Con. 2, 1978; updated 1998 310; 378 . Gravestones of Glengarry Vol. 2 1978 1598265 - item #2 on reel 853 MR ?? Con. 8 lot 9, S end, 1980 149 45 pp see Gravestones of Glengarry Vol 8 1598267 - item #13 on reel 837 MR ?? Con. 1 SRR pt 25, 1984 265 42 pp AW Fraser Library 1598266 - item #1 on reel 836 MR ?? Update:1997 - 117 news stones erected, 58 with additions . 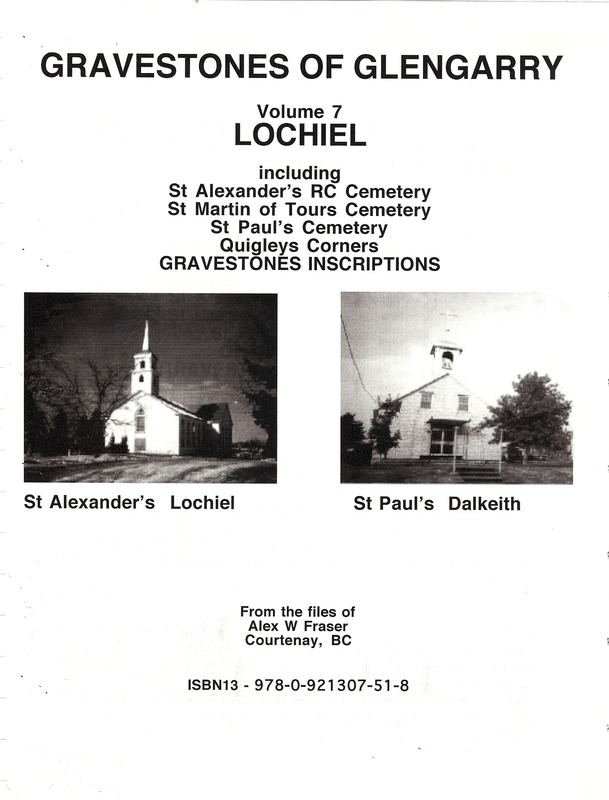 Gravestones of Glengarry Vol. 2 1978 1598265 - item #2 on reel 851/5367 MR ?? 21 pp AWF Library 1598267 846 MR ?? Con. 1 lot 30, 1978/1997 18, Update:1997 - updated to 58 markers . 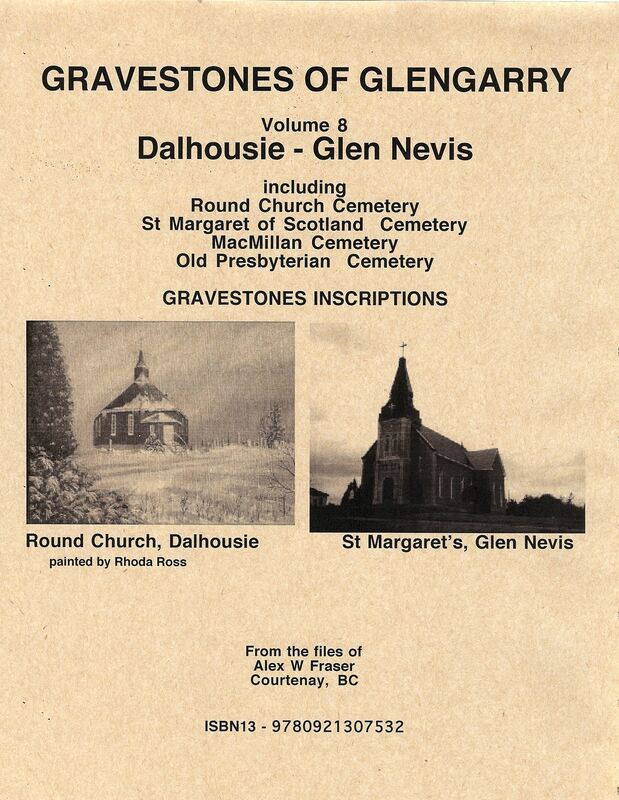 Gravestones of Glengarry Vol 2 1978 1598265 -item #2 on reel 854 MR ?? Update:1997 - updated to 353 . Gravestones of Glengarry Vol 2 1978 1598265 - item #2 on reel 855 MR ?? 36 pp see Gravestones of Glengarry Vol 8 1598267 - item #11 on reel 852 MR ?? 42 pp see Gravestones of Glengarry Vol 7 1598266 - item 15 on reel 871 MR ?? Con. 8, lot 38, 1986 88 . Gravestones of Glengarry Vol 3 1988 1598265 - item #3 on reel 857 MR ?? King's Road, Con. 6 lot 8, 1988 400 . Gravestones of Glengarry Vol. 3 1988 1598265 - item #3 on film reel 6538 MR ?? mid lot 36, con. 7 1984 70 14 pp AW Fraser Library 1598266 - item #2 on reel 8349 MR ?? Con. 2, pt lot 35, Glen Robertson Road, about a mile east of the church 1978 438 part off Gravestones of Glengarry Vol 4 Alexandria 2008 1598265 - item #8 on reel 868 MR ?? (along fence line) 1988 1 -- typed AW Fraser Library 1598266 - item #7 on reel 830 MR ?? not sure where this is ?? ?? ?? ?? ?? ?? MR ?? 8th concession, ?? ?? ?? ?? ?? ?? MR ?? It is possible that this cemetery might be the present day Lochiel, St. Alexander's RC Cemetery, Lochiel ??? ?? ?? ?? ?? ?? ?? MR ?? End of the Glengarry County Cemetery List; 51 cemeteries representing, 8893 Gravestone Inscriptions, all of which are in our files, all are indexed, except the Beech, 6th, 8th, 14th concession cemeteries which have no markers to my knowledge. Where you see a reference to a number such 1598266, in a listing, [of which there are 7 different microfilm reels, thus 7 numbers ] in these cemetery lists, and other of our files of the 5 counties concerned, the files on these microfilm are a result of the more than 11,000 pages of our files we provided the Mormons, [Latter Day Saints] Genealogy Society in Salt Lake City, Utah, in 1994, for the purpose of being microfilmed and the information being perserved. These cemeteries inscriptions are part of the more than 11,000 pages of our files we provided the Mormons, LDS Library for the purposes of microfilming and preservation of our records. 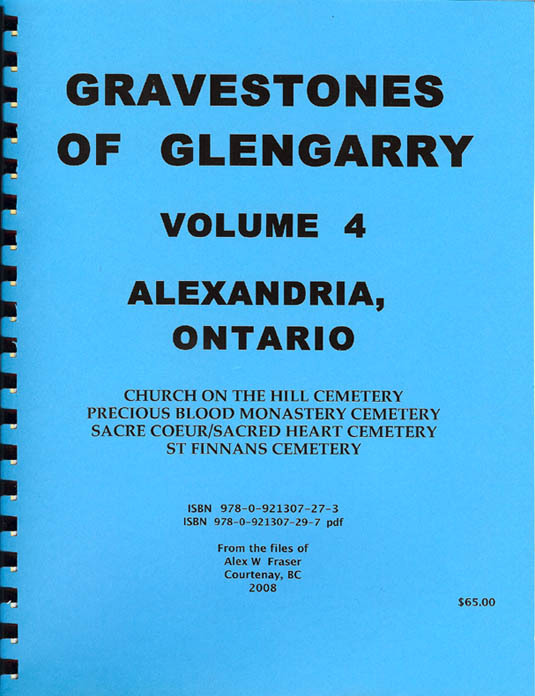 Each of these cemeteries when bound, has in addition to the actual list of inscriptions a front & back cover, title page, list of cemeterries in Glengarry County or township concerned, and in most cases a map, a notice about copyright. Thus the above mentioned pages are included as part of the page count. Also when you click on the cemetery name link it will bring up a page which will indicate the price of the cemetery inscriptions, published volumes. Published Versions: in most cases both a hard copy and a pdf copy is available for purchase. This option is being planned for most of our publications.